Further journal articles on CUP available through the British Library (without hotlinks) are listed here. 2018. Randomized Phase II Trial Comparing Site-Specific Treatment Based on Gene Expression Profiling With Carboplatin and Paclitaxel for Patients With Cancer of Unknown Primary Site. Hidetoshi Hayashi et al. Journal of Clinical Oncology. Nov 2018. 2018. Renal Cell Carcinoma Presenting as Carcinoma of Unknown Primary Site: Recognition of a Treatable Patient Subset. Greco FA & Hainsworth JD, Clin Genitourin Cancer. Mar 9 epub ahead of print. 2017. Perceptions of Cancer of Unknown Primary site – A National Survey of Australian Medical Oncologists: Australian Medical Oncologist CUP survey. Christos S Karapetis et al. Internal Medicine Journal. Jan 2017. 2016. Lung Adenocarcinoma with Anaplastic Lymphoma Kinase (ALK) Rearrangement Presenting as Carcinoma of Unknown Primary Site: Recognition and Treatment Implications. Hainsworth JD, et al. Drugs Real World Outcomes. 2016. 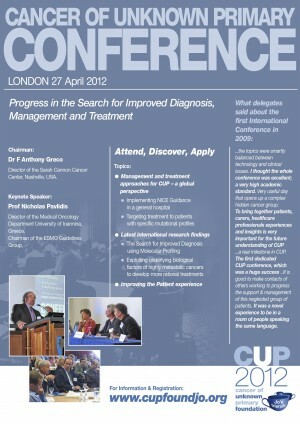 Improved diagnosis, therapy and outcomes for patients with CUP Nature Reviews, Clinical Oncology. Greco, F. Anthony. Nov. Kandalaft, PL & Gown, AM. 2016. Economopoulou P, Pentheroudakis G. Cancer of unknown primary: time to put the pieces of the puzzle together? Lancet Oncol. Oct;17(10):1339-1340. 2016. Practical applications in immunohistochemistry: carcinomas of unknown primary site. Kandalaft, PL & Gown, AM. Arch. Pathol. Lab. Med. 140, 508–523 (2016). 2015. Economopoulou P, et al. Cancer of Unknown Primary origin in the genomic era: Elucidating the dark box of cancer. Cancer Treat Rev. May. Abstract. 2016. A case of S-100 negative melanoma: a diagnostic pitfall in the workup of a poorly differentiated metastatic tumor of unknown origin. Biernacka, A. et al. Cytojournal 13, 21 (2016). 2016. Comparison of responses to closed questions from patients with a known primary versus unknown primary in the 2013 Cancer Patient Experience Survey (England). Schofield, P, Drosdowsky, A, Wagland, R, Symons, J, Mileshkin, L, Richardson, A, Ratchford, D, Bowtell, D, Gough, K. Australian Government. Cancer Australia. 2015. Cancer of Unknown Primary During Pregnancy: an ExceptionaΙly Rare Coexistence. Nicholas Pavlidis, Fedro Peccatori, Fiona Lofts and Anthony F Greco. Anticancer Research 35: 575-580. 2014. Cancer of unknown primary site: still an entity, a biological mystery and a metastatic model. Greco FA. Nat Rev Cancer. 2014. Cancer of Unknown Primary Site. F Anthony Greco & John D Hainsworth in Cancer: Principles & Practice of Oncology 10th edition. Chapter 113, page 1720 et seq. Vincent T. DeVita Jr., Theodore S. Lawrence, Steven A. Rosenberg. USA: Wolters Kluwer. (Full Greco & Hainsworth bibliography). 2014. Cancer of Unknown Primary Site. Gauri R. Varadhachary and Martin N. Raber. The New England Journal of Medicine NEJM 371;8. Aug.
2014. Cancer of Unknown Primary (CUP). Richard Osborne’s chapter in Problem Solving in Acute Oncology. Young A, Clark PI, Selby P, editors. 1st ed. Oxford: Clinical Publishing. 2013. Development and implementation of a service for patients with cancer of unknown primary. Knowles, Gillian. 2013. Massively-parallel sequencing assists the diagnosis and guided treatment of cancers of unknown primary by Tothill, Bowtell et al in J Pathol. Sep.
2012. Cancer of Unknown Primary: Progress in the Search for Improved and Rapid Diagnosis Leading Toward Superior Patient Outcomes. Annals of Oncology. Greco FA, Oien K, Erlander M, Osborne R, Varadhachary G, Bridgewater J, Cohen D, Wasan H. Feb;23(2):298-304. 2012. Patient’s Preferences Matter – Stop the silent misdiagnosis. Al Mulley, Chris Trimble, Glyn Elwyn. The King’s Fund. 2012. Removing the Unknown From the Carcinoma of Unknown Primary. Adil I. Daud. Journal of clinical oncology. 2012. Report of a Collaborative Study Exploring how the Language and Metaphors of Cancer influences Adjustment and Well being following a Course of Cancer Treatment. L. Appleton & M. Flynn. Clatterbridge Centre for Oncology & Liverpool University. April 2012. 2012. A phase II study to evaluate the efficacy and toxicity of oxaliplatin in combination with gemcitabine in carcinoma of unknown primary. Carlson H, Lenzi R, Raber MN, Varadhachary GR. Int J Clin Oncol. 2012 Jan 5. 2011. Understanding CUP – Guidance for patients and their families. Cancer Council NSW, Australia, with supplementary information including videos. 2011. Rare cancers are not so rare: The rare cancer burden in Europe. Gemma Gatta et al. European Jnl of Cancer. 2011. Carcinoma of unknown primary: A focused evaluation. Varadhachary GR. J Natl Compr Canc Netw (NCCN). Dec 1;9(12):1406-12. 2008. Patients’ experiences of carcinoma of unknown primary site: dealing with uncertainty. Boyland, L & Davis, C . Palliative Medicine. Mar. 2017. Cost-effectiveness of using a gene expression profiling test to aid in identifying the primary tumour in patients with cancer of unknown primary. M B Hannouf et al. The Pharmacogenomics Journal 17, 286–300. 2016. Gene expression profiling identifies responsive patients with cancer of unknown primary treated with carboplatin, paclitaxel, and everolimus: NCCTG N0871 (alliance). 2016. Yoon HH, et al. Gene expression profiling identifies responsive patients with cancer of unknown primary treated with carboplatin, paclitaxel, and everolimus. Ann Oncol. 2016;27(2):339. Epub 2015. 2016. Epigenetic profiling to classify cancer of unknown primary: a multicentre, retrospective analysis. Moran, Sebestain et al. Lancet Oncology. Volume 17, No. 10, p1386–1395, October 2016. 2016. Integration of genomics and histology revises diagnosis and enables effective therapy of refractory cancer of unknown primary with PDL1 amplification. Stefan Gröschel et al. Cold Spring Harb Mol Case. Published in Advance August 24, 2016. 2015. Comprehensive Genomic Profiling of Carcinoma of Unknown Primary Site – New Routes to Targeted Therapies. Jeffrey S. Ross, Kai Wang, Laurie Gay et al. JAMA Oncol. 2015;1(1):40-49. 2015. Poorly Differentiated Neoplasms of Unknown Primary Site: Diagnostic Usefulness of a Molecular Cancer Classifier Assay. F. Anthony Greco, Wayne J. Lennington, David R. Spigel, John D. Hainsworth. Molecular Diagnosis & Therapy. Vol 19. Switzerland: Springer International Publishing. 2014. Gene expression profiling in patients with carcinoma of unknown primary site: from translational research to standard of care. Hainsworth JD, Greco FA. Virchows Arch. 2014 Apr;464(4);393-402. 2013. Molecular Profiling Diagnosis in Unknown Primary Cancer: Accuracy and Ability to Complement Standard Pathology. F. Anthony Greco, Wayne J. Lennington, David R. Spigel, John D. Hainsworth. JNCI (See also editorial re this article by Schwartz). 2013. Molecular Profiling for Druggable Genetic Abnormalities in CUP . Daniel S.-W. Tan et al. Journal of Clinical Oncology. May. 2012. Cancer of Unknown Primary: From Immunohistochemistry to Gene Expression Profiling. Wendy M Chiang et al (case report). Journal of Clinical Oncology. 2011. Prospective gene signature study using microRNA to identify the tissue of origin in patients with carcinoma of unknown primary. Varadhachary GR, Spector Y, Abbruzzese JL, Rosenwald S, Wang H, Aharonov R, Carlson HR, Cohen D, Karanth S, Macinskas J, Lenzi R, Chajut A, Edmonston TB, Raber MN. Clin Cancer Res. 2011 Jun 15;17(12):4063-70. Epub 2011 Apr 29. 2009. Multicentre validation of a 1,550 gene expresion profile for identification of tumour of unknown origin. Monzon et al. Journal of Clinical Oncology . 2008. MicroRNAs accurately identify cancer tissue origin. Nitzan Rosenfeld et al. Nature Biotechnology. 2014. Coding Cancer of Unknown Primary: registration and reporting survey of the UK, Ireland and Australia. Oehler C., Vajdic C., Cooper N., Symons, J. Poster. ENCR Scientific Meeting and General Assembly. 12-14 November 2014, Ispra (Varese), Italy. 2014. An audit of cancer of unknown primary notifications: A cautionary tale for population health research using cancer registry data. Claire M. Vajdic, Chuang Ching, Andrea Schaffer, Timothy Dobbins, Lucy Wyld, Nicola S. Meagher, Jane Barrett, Robyn L. Ward, Sallie-Anne Pearson. Cancer Epidemiology. May. 2014. Routes to diagnosis briefing note on CUP. NCIN. 2012. The challenge of attributing causality in Cancer of Unknown Primary. Vajdic, Claire; Wyld, Lucy; Symons, John. Interntational Journal of Cancer. 2008. Unknown Primary Cancer in New South Wales. Elizabeth Tracey et al. Cancer Institute of NSW Monograph. 2010. Early Palliative Care for Patients with Metastatic Non–Small-Cell Lung Cancer. Jennifer S. Temel, et al. The New England Journal of Medicine. 2004. Improving supportive and palliative care for adults with cancer. Cancer service guidance, NICE. March. The findings from the 2009 Conference were published in Annals of Oncology. 2012 Feb;23(2):298-304. Greco FA, Oien K, Erlander M, Osborne R, Varadhachary G, Bridgewater J, Cohen D, Wasan H. Cancer of Unknown Primary: Progress in the Search for Improved and Rapid Diagnosis Leading Toward Superior Patient Outcomes. Annals of Oncology.